Every day, millions of Americans deal with facial and neck pain, a stiff and sore jaw, as well as chronic headaches and earaches. In many cases, these can all be caused by something called a Temporomandibular Joint Disorder, or TMD. Your temporomandibular joints, or TMJs, are the set of small hinges that connects your jaw to your head, and they allow it to move smoothly whenever you eat, speak, laugh, or yawn. Sometimes, these joints can become strained or injured, which can not only restrict their movement but cause all the symptoms we listed earlier as well. 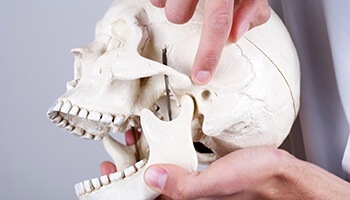 A Temporomandibular Joint Disorder can be caused by stress, trauma, parafunctional habits, diet, the anatomy of the joints, bite alignment, medications, metabolic disease, psychological disorders, and improper growth and development of the jaw. Pain, soreness, or stiffness in the jaw. Frequent headaches, neck aches, or earaches. Constant popping and clicking whenever you move your jaw. A noticeable change in how your bite comes together. A jaw that becomes stuck or “locked-up” when opening or closing. Be mindful to not clench or grind your teeth during the daytime. Try to chew food on both sides of your mouth equally. Avoid sitting with your chin resting on your hands. Do not eat hard foods or chew on ice. Try to limit any physical trauma or stress to the jaw. Use cold compress during episodes of TMD pain. 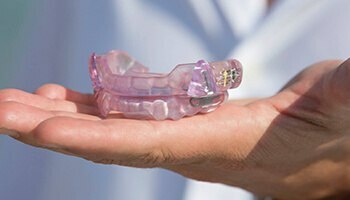 Many patients with TMDs have no history of trauma to their jaw and haven’t undergone orthodontic treatment. If you are experiencing any of the symptoms we have mentioned here, you may well be suffering from a TMD. Fortunately, Dr. Amin Mason is trained to diagnose and treat a wide variety of TMDs right here in Columbus. To get the relief you need, please contact our office for a consultation.